I’m not sure if it’s a sign of my age or the era I grew up in but when I hear: "Would you like a cup of tea?”, "I'll put the kettle on." or “Let’s have a cuppa.” I feel as if I’m being cared for. I grew up in a time when fizzy drink was always ginger beer. Coke was around then but it seemed out of place, sort of unAustralian, and we didn’t drink it, although as a Christmas treat, mum would buy a crate of 12 "mixed fruit drinks", delivered to our door by horse and cart. Yes, that was Sydney in the 1950s. Bread and milk was delivered every day like that too, right to our door. Our cold drink of choice was cordial and when a hot drink was called for, it was tea. Although all through my life, my mother drank the strongest black coffee that looked like liquid tar and I think was made with chicory. I clearly remember drinking milky, sweet tea with my grandmother. She had hers black and now that is how I drink my tea. There is a lot I don’t recall about my childhood but I clearly remember the feeling of being loved when I was called in for tea. 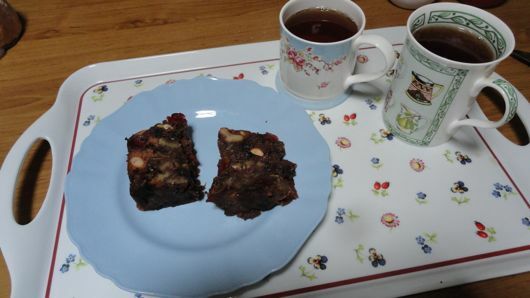 We didn’t always have cake with our tea but when we did it was homemade and often it was fruit cake. Biscuits were bought then, a new convenience, at the local corner shop from Arnott’s tins that contained a single variety of biscuit like Monte Carlo, Spicy Fruit Rolls, Honey Jumbles, Iced Vo Vos, Milk Arrowroot or Custard Creams. Biscuits in packets were yet to surprise us but it was always a treat to go with mum to the shop while she chose biscuits that were put in a plain brown paper bag to be brought home to our biscuit barrel. When we went to the zoo, a very rare treat, we used to go to that same shop to buy a small bag of broken biscuits to feed to the animals. The Arnott family who produced those biscuits lived not far from us in a huge mansion house. It’s still there but they are long gone. Their factory, which I think was built around 1900, was located near where the Sydney Olympics was held at Homebush. These are the little floating tea balls Sunny gave us. I haven’t lost my affection for tea. Hanno loves a cup around 10am and we sit together on the back verandah in the summer and the front verandah in winter and talk while we drink our tea. I always use loose tea to make a single cup or a pot and always use a little tea ball. Sunny bought us some nifty new tea balls recently. They float around in the tea until it’s time to take them out and sit them in their little drainer saucer. Tea bags are like Coke to me, they don’t exist. My favourite tea memory is from Sunday evenings in winter, before TV started, so pre-1956. I would have been seven or eight then and Tricia nine or ten. We, along with the entire neighbourhood, would have had a roast for Sunday lunch and a small amount of the remaining meat would have been put aside for toasted sandwiches in the evening. Around 4pm, dad would light the open fire in the lounge-room, all the windows and doors would be closed, and at around 6pm, he would load up our tea trolley with roast lamb or chicken, along with a small bowl of salad, bread, butter, mugs of milky tea and mum's strong black coffee. Mum would test Tricia and I on our spelling as we sat by the fire in our pyjamas, dressing gowns and slippers, and then we'd toast bread over the hot coals and everyone would make up their own sandwich. This was mum's night off cooking. At about 7.30pm, mum would lay out two woollen blankets by the fire so they were nice and warm, and Tricia and I would each lay on one and get rolled up like big cigars. Then dad would carry us in to bed and tuck us in. It sounds incredibly innocent now but it is what we did and I still recall it with a lot of affection. In my mind, offering hospitality and being cared for seems to go hand-in-hand with a cup of tea or a glass of cold cordial. I’m sure it’s deeply ingrained into my being and will remain there forever. They aren’t as fancy as the iced or flavoured teas and sparkling mineral waters on sale now but they quench the thirst as well as anything else and they provide that warm and comfortable feeling of yesteryear for me. A time when there were few alternatives and everyone thought that was just fine. What is your favourite tea memory? We don't have tea time in the US, but I do remember drinking coffee with my dad for breakfast, even as a very young child of five or six. I still head straight for the coffee first thing after I wake up - even after all these years. Iced tea, which I love, is very important to my Southern culture. Hot tea is delicious to me, and I sometimes will have a cup when I get home from work in the afternoon as sort of a pick-me-up. Love it with honey and milk. I enjoyed reading about your sweet childhood memories. We're about the same ago - things were so different in the 1950's. Thank you, Rhonda - and, by the way, what are those red and green kitchen utensils pictured above? I love tea. I drink two cups each day, usually, very ritually. I have one cup in mid-morning and one in mid-afternoon. My favorite memory of tea is when I was very little and my father would drink herb tea in the evening. It must have had peppermint in it because that's the scent I remember. He always let me have a sip. I enjoyed that a lot. Well being English we still live on tea and the kettles rarely cold when we are at home especially in the colder months. We like you always had a roast on Sundays and a cold buffet type tea on the night with left over meats, although we wouldnt toast our bread we still made our own sandwiches. My Granny had a range and the big enameled teapot sat one side and the kettle was always singing on the verge of boiling. As anyone came in the kettle would be nudged onto the hot plate and cups, saucers milk and sugar and a pound cake would be on the table in two ticks. The tea was strong and black and I never took milk or sugar then and I do not now. We love Tea in our home, not matter, whther a friend callign around, or bad news, or someone needs cheerign up or a chat, you can hear, "i'll just pop the kettle on or " fancy a brew". We never 'did tea' growing up, but we did have green tea with toasted cheese sandwiches for dinner or breakfast. That taste is ingrained in me as a 'comfort' food, because it was eaten at a time of day when all of our family were together. I introduced my girls to the notion of 'tea' a few years ago and they love it! We serve it at 5p.m. and it is really just a small snack of maybe ice cream and a cookie or small chocolate =) Just something to tide us over until dinner which is at 7p.m. but it too is done to draw the family together. On the weekends we have a fancier and longer tea. My mother's beautiful teapot, which she passed on to us (and which was the first thing she ever bought for her own mother) is put out and a mint tea is the tea of choice together with a wider yummier selection of goodies to go with it. The girls love to dress the table with a lovely cloth and flowers as well. Tea for us is always on the back porch where we can watch the sun go down on our garden. The light at this time of day is amazing and makes the event even more of a treat. We also have hummingbird feeders which draw a few guests as well. When we are on holiday and away from home we still take the time for that quiet little togetherness of teatime. When I read your post today it brought back the times of the cups of tea and the lying in front of the fire on the cold Winter nights. We had an open fire-- this was back in the day before log fires. Mum would dish us up ice cream and we would put Milo on top of it and wait for the ice cream to begin melting and then stir it all together. I also remember drying my hair in front of the fire on a Sunday night. No hair driers in our home. I love being in a home with an open fire even to this day. 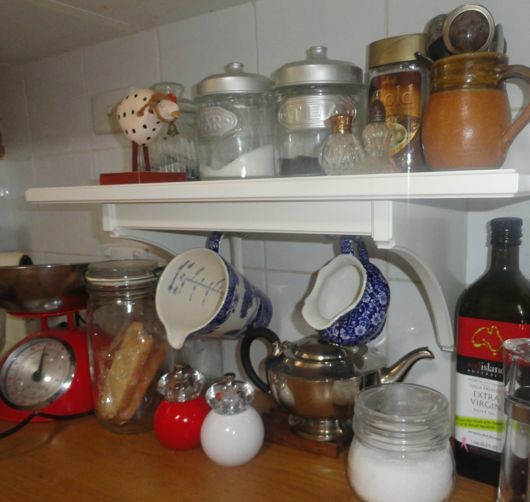 tea has always placed a central role in my concept of a homemaker! My mother and grandmothers always served tea to anyone visiting - the kettle was always just boiled ,being boiled or about to be filled!My mother drank cup after cup. Living in Canada we have LONG winters ( It's April and we will have more snow tomorrow) so all of my children- now teens or young adults started drinking herbal teas as toddlers daily. Four are still with us here on the farm and they like me are never far from the kettle or a cup of tea.Wonderful memories- thank you! This has to be my Favorite post Rhonda..thank you for sharing a small part of you and your family. I also love tea and try to make time for a cup each and everyday. My favorite time to drink hot tea is in the cooler month's...a cup of tea and a good book..sounds great! We drink a lot of iced tea in the summer..you never mentioned iced tea do you and Hanno drink iced tea? We don't drink iced tea, Renee, mainly because I've never found a recipe I like enough. Most of those I've tried have been too sweet. Do you have a recipe you could share? Ahhh...tea! Whether it's my first cup in the morning (made unfailingly and with love every day by MrEH) or in the guise of "tea & cake" in a carefully chosen cafe on a day out, it's got the be the best drink imaginable! My tea memories are quirky! Both my parents were diehard coffee drinkers. I must have been 5 years old (circa 1958) when my dad was home sick with a bad cold. He didn't go to work for 2 days, which in my short life, was something amazing and serious. Mom made him hot tea with lemon. This was the first time I ever saw this beverage! Dad said in a hoarse voice, "I only drink this when I'm sick." He must have really been ill! My next introduction to tea was when it was served in Chinese restaurants. Fast forward to 1970/71: I meet my future husband whose hot drink of choice is tea. Hates coffee! (I married him anyway :) ) So there goes the old saying that girls marry guys that are like their fathers :p June will mark 41 years with my tea-drinker. Drinking tea helps me to relax, and brings wonderful memories of my nana, and my babysitter. Both would make drinking tea like a wonderful event. They would bring out the fine china (teapot, cups and saucers etc), the dainty little tray with treats like biscuits, home baked Louise cake or my dear babysitters homemade marshmallow. They were all little slices, that I would take tiny bites out of to make last. I was little when they first started, and grew up still into my teens loving these moments to connect with these two special ladies. The love of tea has been passed on to my husband, and children. And I have my little fine china set, that I love to bring out and use. Such a beautiful strong memory, Nellie. I know the area inland of Mackay well - around Nebo and Glenden, we lived there for many years. I can almost see you two sitting there listening to the Blue Hills theme music. Thanks for sharing your memory of corned beef and pickle sandwiches and fruit cake. I just caught the train back from Sydney to Armidale, and believe it or not you can still see the Arnott factory from the train window! This made me very nostalgic as I loved passing it as a kid. So hard to choose a favourite tea memory. I certainly loved having tea at my Nanna's, and she always let me put way too much sugar in! If she'd made scones as well I was in heaven. These days I love to put out my best cups and have a loved friend over for tea - this doesn't happen often enough for me - with all of us now out working again it's a time I treasure. Tea always reminds me of my grandmother. I'd stay with her in the school holidays as a child. Breakfast was always served with a hot pot of tea, it made me feel so grow up, we'd chat about the day ahead. Rhonda thank you for writing this post it has brought back a flood of cherished memories. What a lovely post. Thanks for sharing your memories. I grew up drinking coffee and have enjoyed coffee all my life. The last few years I have started drinking tea- both iced tea in summer and hot tea with honey in the winter. I enjoy them both equally now. And just recently I tried an organic strawberry tea which tastes wonderful! So funny to see the title of this post as I had just brought tea in to the computer to catch up. Oh tea! What a special beverage, it soothes the soul and uplifts the heart! No matter if you're gossiping or commiserating tea will always fit the mood. My Mum starts every day with a cup of tea in bed brought to her by my father. It's one of those quaint gestures of love that only those closest to them would be aware of. Lunch at their house is served with a large pot of tea on the table, and the first thing that happens when anyone arrives at their house is the kettle gets put on. One of the first mimicries my daughter picked up was the 'ahhh' after that first sip of tea. She couldn't even crawl but she could pick up a tin tea cup and pretend to drink followed by that gorgeous exaggerated 'ahhh'! I drink my black tea black, with a rose geranium leaf added if I need a special 'lift', peppermint tea after meals, and various herbal tea to cure whatever ails me. Morning and afternoon teas with my girlfriends requires multiple pots of tea on offer with loose leaf "Girlie Grey Tea" by T2 and whatever else takes our fancy. Living in Chinatown we drink a LOT of Chinese teas. Gosh this has really taken me down memory lane and whet my appetite for another cuppa! Cheers! 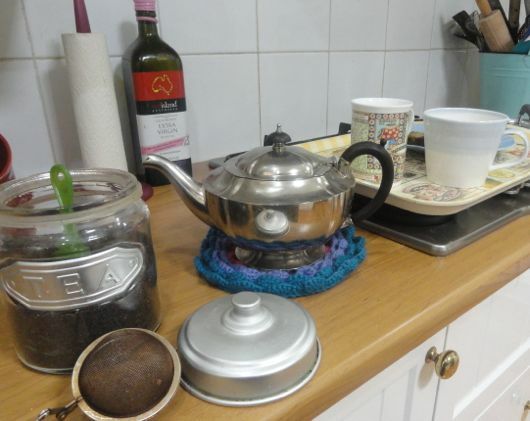 I present a lot of eduction workshops, particularly for Aboriginal communities, and offering a cup of tea is like a special little key for making someone feel safe and welcome. I never arrive at training without teabags and a packet of bikkies. My tools of the trade. At home I have a growing collection of mis-matched china and vintage table cloths and find that having a 'formal' tea with my 3yr old son is a lovely little ritual we share. What beautiful memories! Thank you for sharing them. What a wonderful recollection of memories. I have recently lost two grandparents and now know how treasured their stories are. I wish I grew up in a different era, before computers, iPads and iPhones. I would love to hear more of your memories. Thanks for sharing. Thank you for sharing this memory. I found myself actually picturing you and Tricia by the fireplace being wrapped up in blankets! I'm an avid tea drinker, but green tea these days. Unfortunately my local area doesn't sell green tea not in tea bags. Gosh... here in Colorado, tea isn't really a big deal, and growing up the only person I knew who drank tea was my dad. He was a tea addict, in fact... Whenever I think of tea, I think of my dad, drinking tea from his old tin cup with a toothpick in his mouth (not sure how he managed that, come to think of it), driving around in the beat up old 1950's pickup truck that he bought used from the US Forest Service. Even now, I can smell the inside of that truck... the musty smell of the sunbaked old vinyl upholstery, the somewhat acrid smell of the tea, and of course, it smelled like Dad. My Grandmother lived next door to us from the time I was 6, so cups of tea with an English Ma was always made with milk and 2 sugars, in a teacup.The china cabinet was full of crockery, but the "best" ones were a set of six different pastel colours with gold trim, I got to take my pick when these were used for special times. Tea was served at breakfast, morning tea, lunch, afternoon tea, dinner and supper, usualy with cake or Saos depending on the time of day. You never stirred the leaves in the pot to hasten the brew, as that would be "stirring up trouble" and if you misplaced the teapot lid that meant "you would soon have visitors" the tea was Lan Choo and the pot was always warmed first. One of my uncles would reheat his morning brew on the gas stove in the metal teapot for tea throughout the day, my Grandmother said it was stewed slops and refused to drink it,I can't imagine what it did to his stomach ! I still drink tea 2 or 3 times a day (no sugar) and often think of my Grandma when I sit with a book or my knitting and a cuppa ,she died when I was 16...we were very close. Margaret, we're cut from the same pattern. I really related to your comment and found myself nodding and smiling as I read it. We drink King tea, which is the old Billy Tea. It still has that same strong flavour I enjoy. Yes, both the same age, both raised in Sydney, if you want a trip down memory lane take a look at "Days on the Claise" blog, Simon has posted an old 1966 immigration dept. film for those thinking of moving here. I think my Mum and Grandma drank Lan Choo for the coupons, big trip to the city once a year to choose some reward gifts. Money was tight with 4 kids, carpet, blinds, furniture and appliances were payed off gradually and bedspreads, towels etc were bought on layby from Waltons. Small debts easily paid off one at a time,less stress than the huge debts of today. I have the edges of a similar Sunday night memory Rhonda, I can't quite grasp it but it involved Disneyland on TV and eating in front of the TV as a Sunday "supper" treat -- maybe it will come to me. I have, in the last few weeks, become a herbal tea convert. I used to drink too much coffee, then cut it down to about two cups a day with a cup of tea later in the day. Then I decided I did want to explore hot drinks further so I've been experimenting with teabags of herbal tea, it's been quite a revelation! You can actually buy unbleached bags these days. I used to think of herbal tea as wishy washy leaves, in fact there are some gorgeous fruit teas and, when drunk very hot with a smidge of honey, they are utterly delicious. My mother always drank tea, but I never did. I was a war baby and my mother used to give my tea rations to a couple whose son had been killed in the war. I am still a coffee drinker although am trying to drink green tea. Lovely post Rhonda with lovely memories. My "tea" memory concerns not tea but coffee. When I was in elementary, jr. high and high school my parents managed a small hotel in northeast Texas. It was a small hotel in a small town and we had a lot of salesmen who stayed with us on a regular basis and since my Dad was one who "never met a stranger" we got to know them really quite well. Every afternoon around 3:30 or 4:00 when the "regulars" began checking in my folks would make a pot of coffee which they were invited to share. I had drunk coffee for any years at that time and so was always in on the coffee time. So for me it means hospitality and a time to be with friends and family. My grannie ( long gone ) used to take me to her friend Cuzzie's for tea after school when I was a kid. Always made in a pot,with a cosy and I always sat there quietly and well behavedly. This is one of my fondest memories. It was a ritual they had since war times and now as an adult, I am privileged to have been included. This is just the loveliest post!! I have similar memories of growing up in Sydney in the 1950's. My Dad always made us a cuppa every morning served with thinly sliced buttered bread and vegemite. 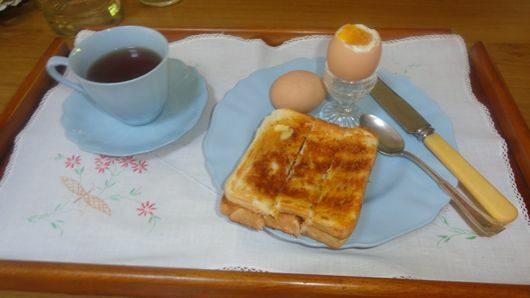 Sometimes it was served in bed when we felt lazy or it was a holiday. Tea when staying with Nana was promptly at ten and four o'clock. Homemade cakes and biscuits were always served with it. If Arnott's biscuits were bought from the shop you could get a "mixed" bag and nearly always they would include one chocolate one! Served to you from the big tins into crispy paper bags. My memories of going to school are of passing the Peek Freen (spelling??) factory on Parramatta Road and smelling the Cream Wafer biscuits. I wonder if they ever made any others?? We never had "bubble drink" as it was considered gut rotting poison but remember the lucky school friends who did get theirs sometimes delived in crocks with a stopper! Rhonda, thanks so much for sharing your memories with us. this is such a sweet and comforting post! i've been drinking tea my whole life. i remember my parents using loose leaf Ceylon tea when i was little, sometimes we would drink it black(with sugar, of course), sometimes with a splash of milk. it was always very comforting to sit in the kitchen with the grown-ups holding our cups of tea, especially if it was cold outside, listening to their conversations. nowadays, i still prefer loose leaf tea, in particular Assam, and i usually have several cups a day. i really cherish our tea breaks and we usually have homemade quick breads or cakes with it. p.s. just wanted to let you know that i've made the chocolate cake that you posted a link to recently and it was to die for! so easy and so delicious. i made a white vanilla frosting instead of the chocolate one and it was so good. thanks. My mom always put the kettle on and had a pot of tea around 4 in the afternoon. Neighbors knew when to stop by - some of our neighours used to have tea at 3pm, but for us it was 4! I also remember going to the big department store with my grandmother occasionally for tea and anchovy toast. Now I always have a pot of tea after dinner, my grandson calls it "Gradmas cup-a-tea". Thanks for that post - it brought back some lovely memories! Love cuppa time...my children all enjoy a cup of tea...I remember my nana had a special cup and saucer, small, pink that we used to have our cup of tea at her house in...she had a flip down toaster too, the one with the sides that folded down and you cooked your crumpet till it was how you like it, not till it popped up..! I have a teapot , and a cosy and when I have a friend over that is how I serve tea...I know sometimes it gets a raised eyebrow but that is how it is done here....special breakfasts all together outside under the vines, always has a pot of tea with a cosy, my children think this is 'normal'....lol....I think being rolled up in a warm blanket like a cigar would have been fabulous fun.....I love remembering things like that, our together weekend nights were mum sitting with a chopping board on her lap with fruit, and cutting up fruit for us all....or on some nights, whhoohoo there was a block of cadbury chocolate, one block between six of us.............now that was a treat.! I remember drinking very hot weak black tea on the back steps at Grandma's, with proper Arnotts Scotch Finger biscuits (not the cardboard version around now) and waving to the trains as they sailed by. Mum drank Bushells coffee essence WITHOUT chicory -I had to take the wrong one back a couple of times. Without chicory - gotcha. Remember that little wire front cupboard she kept it in? I'd love to sit on those steps at grandma's again. We have a few photos of us there in our school uniforms. Yes I do remember - my memory of photos on the back steps are of birthdays and one with Dad with Christmas paper hats! They were the same back steps that I remember watching Grandma hack the heads off chooks. The wire safe was also used to put roast meat or corn beef in as well in preparation for sandwiches or cornbeef hash. I think Memory Lane should be a semi regular on the blog- just a thought. This really spoke to me. While I love a cup of tea, not many of my friends drink it, and we don't really have an established tea time here in the US. I remember the first time I went over to a new friend's house and she made us a pot of tea and we chatted as we drank tea and ate homemade pumpkin bread--I felt instantly at home, and we remained close "tea buddies" until she moved out of state. Love your tea memories! Hasn't the world changed so much?! My tea memory is perhaps a bit different than most. I'm English, but living in the US. A few years ago I had an office job at a preschool, and each day I'd have a cup of tea, and quoting a mostly forgotten English advert, I'd say, "Ahhh. Tea. Is. The best drink of the day!" Apparently this innocent habit caused a problem in the classrooms. As they recited their ABCs, the children would get to T, and continue, "Is. The best drink of the day!" and never got to U,V,W,X,Y or Z.
I have tried sooo many times to like the taste of tea (and coffee) but I just don't. I've tried it with sugar, milk, lemon, strong, weak, I just can't get myself used to the taste. To me drinking tea seems very 'grown up', and I wish I did like it. Maybe one day I will! I thoroughly enjoyed your tea stories interwoven with memories of the past. I quite like tea (white, so sugar) and have it every now and then, but I'm afraid coffee (cuppucino, no sugar) wins for me hands down. I was brought up in a coffee drinking household (instant international roast "before they changed the taste of it" says my mum). We know a farming family near here and the father makes everyone (kids included) a cup of tea at breakfast every morning. I think this is a little tradition they will always remember. I always feel a little disappointed when someone turns down a cup of tea or coffee. I feel that conversation flows so much better, more honestly and less rushed when all parties have a tea or coffee in their hand. We have friends that say they only make friends with other coffee drinkers, but I think they allow tea drinkers too :) Such a small but important part of our day to day. Gosh I had forgotten about that.....back in the day, International roast instant coffee was not only very good tasting but quite cheap, we used to drink it all the time, then suddenly it tasted like floor sweepings !!!! never improved, (tried it at friend's) so never bought it again. Personally I hate tea and coffee and I am darn sure it is related to the rituals and sheer number of cups I have made. By five I was making tea for the family. Having had my whinge I now sometimes bless tea. My dad has Alzheimer's. As soon as the agitation etc starts, the kettle goes on and a cuppa is made. I love my tea. My 13yr old daughter and I share a pot of tea of an evening or on the weekend. On the weekends we have it with a treat such as a slice, biscuit or cake. I love the tradition of it and love the time I get to spend with my youngest. Oh and I forgot to add this week I have bought 11 boxes of tea. That should last my tea addicts three months. My grandmother drank her tea with sugar and milk, and that's where I learned it. 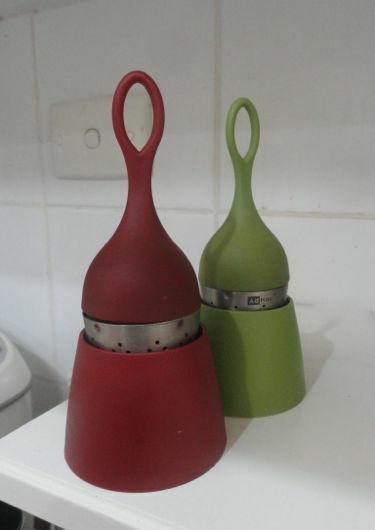 But before teabags, she used to make a tea concentrate in what people now think is an individual teapot. Each morning you put in tea leaves and water and just let it stand. When you wanted tea, you poured a bit of it into your cup and added hot water. My first tea memories are of when as a child in the late 1960s onwards during the holidays (because otherwise I was at school) at eleven in the morning, we had elevenses. The house was a large, beautiful Edwardian manor house in the heart of the Cotswolds. My father was a butler, valet and chauffeur and my mother was the cook and also within the household was a housekeeper and two daily cleaners; who would all congregate in the kitchen for a cup of tea and Ryvita with butter and cheese and Lardy-cake on Friday mornings. There was a large cream coloured Aga cooker (with the requisite cat and pug dogs and labradors nose to tail in front) and a large dresser with the most beautiful willow pattern china and in the middle of the kitchen was a large kitchen table and chairs. Everyone always took up the same places and the chatter, gossip and laughter would commence as the tea was poured out. The teapot was a large stainless steel teapot (excellent pourer, I remember,) the crockery was a blue and white striped Cornish ware mug-type tea cups with saucers and a jug with fresh creamy milk. I have always liked strong tea with a little milk and no sugar. Whenever I see Ryvita and Cheddar cheese, I always remember those elevenses of my childhood filled with laughter and chatter. Being a baby boomer too and about 9 weeks older then you, we have a lot in common, although here in Europe we hear less about Australia the about America. I remember the Berlin wall falling and Nelson Mandela's release (it was on a Sunday afternoon time here and we went and sat in front of the radio and TV and rejoiced heavily) and most of the things you mentioned. Could you please do a blog about the costs of burial and cremation? it is shocking how many people over here in the Netherlands choose blindly to ignore the item of death and do not know what either would cost basically and what the extra's cost. They all think their insurance, they took maybe 20 years ago, will pay for it. When there is not enough money in the bank, they take the risk of mounting their children with a debt just to make their wish of a decent burial or cremation come true (not speaking of family feuds when one of the children can not or will not pay for it). My mum and MIL died within two months last year and the money in botch cases was reserved for just that, it made the aftermath of their passing away at least less traumatic, we have taken care of those costs already too, updating the money every two years. I feel like that about tea too, there's something so ingrained in our psyche and culture about the drink, isn't there? And for me, your posts are a bit like a nice hot cup of tea. Warm and comforting. I lived next door to my grandmother when I was very young and remember sitting in the afternoon as all the uncles and aunties came home from work and had a cup of tea and a jam tart and a chat about their day. When I was older, and a tea drinker, my school was near my grandmothers house so for a few years I popped in every day after school for a chat, a cup of tea and a crumpet. Not surprising. You Aussies were an English colony for a long time. I was raised on tea as well and my mum gave it to me from the time I could hold a cup. There is nothing like it: warms when you are cold; refreshes when you are tired, cures depression and comforts you. It is indeed the best. Naturally, being English I drink it with milk and sugar, although lately have been holding off on the sugar a bit. But I still like half a spoonful anyway! Such a wonderful story. It is the little things. So very important. It doesn't have to cost any money, but it will stay with you for the rest of your life !! I'm more of a coffee and chicory person but I do like a lovely cup of chai or green tea from time to time. Though I'd have no idea how to grow/make Chai, I found out recently that the British weather is suitable for growing compact bushes of green tea. I imagine I'll look into it if I ever start drinking it more regularly. On a side note, I was shocked this week to discover that tea can now be purchased in granules, like instant coffee. I've never seen it before and wonder who would actually buy it. 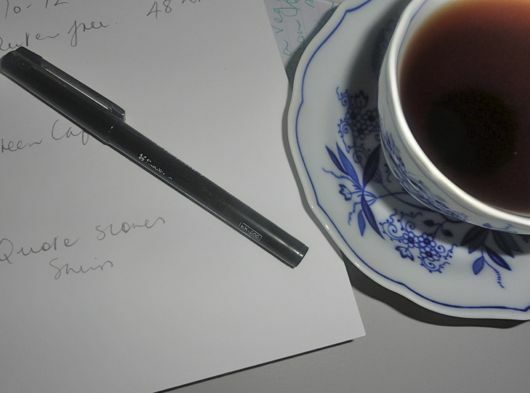 As you illustrate in this post, making and drinking tea is a ritual of comfort and tradition. Sitting by my grandmother's coal fire, with the light fading outside, but the lamps not yet switched on. The north of Scotland, mid 1960s, I was 4 or 5. Drinking mugs of tea with sugar. The mugs were soft 1950s pastels, with a few very thin black stripes - I'm still looking for those in every charity shop. My favourite was the yellow, my grandmother's the pink. Just sitting with my hands around the hot mug, looking into the flames of the fire, so cosy. OOOOoo a good cuppa tea !!! Here in Yorkshire ( England)that's what were bought up on ( I'm a 70's child myself ). A good cup of tea and a slice of cake or some biscuits is a cure all . I confess coffee is my poison but sometimes you can't beat that first sip of good cup of tea !!! May you keep enjoying the simple pleasure of tea ! Thank you for the charming tea memories. Oh, what nice memories to have of your family. Perhaps its our being American, but I do not have any happy tea-related memories from my youth. I am making many now though. My sister and I had a tea party picnic in the green grass of the backyard with my niece and nephew a couple years ago. We had fruit and tea with milk and sugar (though I drink mine black as well)and sat and watched the birds and chatted. The kids thought it was excellent fun and so did I. Offering my guests a cup of tea is a way that care for them, as you say, and I quite enjoy it--though I've only started doing so within the past five years or so. I have a little ceramic tea pot to steep the loose leaves in which I got from my great aunt which makes it special to me. I really enjoyed this post Rhonda, especially the Sunday night ritual of your childhood. I loved tea as a child and now as an adult I adore it. It is absolutely my drink of choice. I remember it was a treat on some Sunday nights when Dad (who for a few years brought us up on his own before remarrying)would make up a huge batch of scones and we would eat scone after scone with apricot jam and cups of tea for dinner. This is one of my favourite childhood memories - so simple but yet so memorable. This is just a lovely post. Thank you for sharing your memories. My favorite tea memory is drinking hot meadow (mint) tea with church friends. It was incredibly sweet, but I remember my surprise that the iced tea we drank in summer could taste wonderful hot in the winter. I will always remember my first cup of tea, though I can't remember how old I was. It was breakfast time and I was staying with my Aunt in Holbrook, country NSW, can't even remember why I was staying with her on my own, we always traveled there as a family. She made me a cup of milky tea and Vegemite toast. I had never felt so grown up, tea in my family was an adult's drink, children didn't drink it, we had Milo. We had a dozen bottles of soft drink delivered, not by horse and cart though, can't remember if it was weekly, fortnightly or monthly. The empty bottles were put out for pickup when the drinkman was due. I do remember carrying a bottle in and dropping it when I was 4, cutting my foot in the process, at 17 when I started wearing high heels I developed foot pain and an abscess. There was still a piece of glass in my foot. We rarely, if ever, had Coca Cola. A couple of times a month, on a Saturday night we would visit relatives, as a treat Dad would buy us each a pack of chips. We used to lick the flavouring off the inside of the pack to get the most out of them. It was back in the day when the packs were smaller than the 50 gram available now. Always took a bottle of the soft drink with us. I was raised by my grandparents in the 60's, and like your family, we'd have a roast for Sunday lunch. For Sunday dinner nana would bake scones, then her, pop and I, would sit around the kitchen table slathering them with butter and piled spoonfuls of her homemade jam. And in the centre of the table? A huge pot of tea dressed in a crocheted cosy, which we refilled at least once as we enjoyed the 'lazy' winding down of the weekend. I taught my children at home, and we'd break around 2pm for afternoon tea each day, a sentimental reminder of my nana and pop...served with beautiful op-shop china, a tea pot, and fresh baked treats. My daughters still love to have afternoon tea with me. When I was a little girl, my dad used to get me to carry his first cup of tea of the day, into him in bed. I was the youngest child at the time (around 8 years old) and as I walked into the room, he'd always say to me, "Is the tide in or out? Careful as you walk...don't spill any!" It always made me smile because I KNEW I had great co-ordination and wouldn't spill any. When I got to the bed without spilling it, he always told me I was the very best at delivering tea. It made me feel special, even if the reality was that the older teenagers weren't so keen on tea delivery lol. Tea is very much intertwined with memories of family visits to my Nan and Pop. The cups of tea were served from a big enamel pot, though only for the adults: we kids didn't drink it. Pop would pour his tea into his saucer - for quicker cooling - then slurp it loudly. It was a party trick, but born of necessity: his morning shift on the railways required a very early start, so the quick-cool tea was a shortcut to making sure he'd had a cuppa with breakfast. Different world for tea drinkers now. After high school, I had a brief stint working on the line in a tea-packing factory in Brisbane. We packed 3 grades of leaf: cheapest Green label, mid-range Red, and top-rank Blue. I was able to keep Nan supplied with tea for years. In later life, Nan switched to using tea bags. I was appalled, because the taste was so-oo bland compared with good leaf tea. I'm still sticking with good-quality black leaf, even though it's increasingly hard to find at the main stores. Lately we've joined with friends to buy a yearly consignment of fair-trade packs of pure Ceylon tea - bliss! Thanks for the topic Rhonda. I live in the states and my earliest tea memory is of my grandmother letting me drink hot tea with milk and sugar in it. Still my favorite way to have hot tea! Thanks Grandma!!! I read your posts everyday as I get your updates on my sidebar and its become a morning ritual for me to read your post with my cup of tea.. Due to the time difference in India I always have a new post by you for reading early in the morning. My favourite tea memory is having imported Rose Hip tea, with my mom. She used her special delicate bone china cup and saucers, and I loved the tart taste of the tea, sweetened a little bit with honey. We would have them with Peak Frean's Digestive or Shortcake biscuits. My mom has been gone now for more than 2 decades, but the memory of our chats over tea is as clear as if it happened last week. My favorite tea memory is as a teenager, sitting at the end of my parent's bed sipping tea and chatting together before catching the bus to school. Such lovely cozy memories! Thank you for such a dear, homey, Grandma-blog. I enjoy following your writings, and first fell in love with the photos you have posted of your home. I have always loved the old, worn, homemade items and delicate mismatched beauty of heirloom type treasures. I love making little "finds" to add to my treasure stash. Pretty tea cups are a favorite, and odd antique dishes to go with them, old silver spoons, and tablecloths; then a vase of flowers and you have a homey inviting setting! Thanks for your hospitality to all of us readers! Ahhh, a cup of tea makes my day complete. I've been having a cup of tea, almost daily since the age of 4 - well, that's my earliest recollection of having a cuppa. When I was little, I was given my very own special little tea pot, with a knitted Hawthorn (gold and brown) tea cosy, given to me by my Grandma that I remember using often. I'm excited now when I think of my young daughter, who at 17 months knows that her Mummy drinks "hot tea". I look forward to sharing a few cups of tea with her. I always love reading your blog. I have had a tea revolution lately. I found a glass teapot with strainer at the Salvos. I bought leaf tea and I drink out of old china teacups from the Salvos too (they're smaller, so you can have two serves!!). I love it and now avoid chunky mugs and tea bags. I remember growing up and going to my mum's friend's house. She had a blue teapot and also served us a cup of tea... but she wouldn't let me have sugar! Mum always had a pot of tea on the table, back in those days we still had a wood burner stove, the kettle always on the side at a simmer. My first memory of drinking tea was from my grandfathers saucer, he would sit me on his lap and pour a small amount onto the sauce and let me sip from the saucer. I have given both my daughters a tea set and teapot each, we have afternoon teas regularly, with a cloth on the table and beautiful cups and saucers. This makes me so happy as we sit and chat about the things happening in their lives. Rhonda this was beautiful! Being young (26, ahem) and from the U.S., tea was not part of my day until I married. Then me and the husband began a love affair with hot teas. We generally have a cup every evening before bed as a wind down to our day and recap over what went on while we were apart. Now that our children are getting older (1, 3, 4, and 6) we include them and take tea in the afternoons before nap time when I gather the kids around the table for a pot of green tea and a chapter from a good character building chapter book. It's a lovely time and I pray gives them wonderful memories. Tea was my link to my grandfather. Coming from a family of Texas, the drink was coffee or beer. When my grandfather served in WWII his unit was with a unit of Australians. That is where he started drinking tea. When I was little, at some point, he shared a cup with me and I was hooked. I was the only tea drinker at that time unless I was visiting PaPa. But when I did I would ask him for tea. He would do this little tickled laugh sound in the back of his throat and say "Would you like a cuppa tea?" in an Aussie accent. That would start me giggling. And we shared many cups together over the years. I really miss my grandfather. I have continued the tradition with one of my daughters and it reminds me of him every time I see her curled up with her tea. Life is good. While I don't have a tea memory, I do have a coffee one. As a young girl, perhaps 3 or 4, my father worked a lot, and I really don't have much of a memory of him, but then again, what memories do children so young have? Anyway, my father would be up early to leave for work and some days I would sneak out of bed to find him in the kitchen making a cup of coffee for himself before he left for work. Now, did he "really" make a cup for me as well? That I am not sure, but my memory is of he and I having coffee at the kitchen table together before he'd leave for work. I haven't thought of that in a very long time, thank you for the memory.